Musings of a Furniture Maker: IDS11 - It's a Wrap !!! 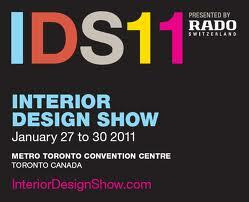 Today was the third and final day of the Interior Design show (IDS11) . Once again the attendance was strong, and with some careful planning we were able to stretch Kevin's literature into the final minutes of the show - even if only barely. The show closed promptly at 6:00 p.m., and that's when the real activity started with everyone busily packing up and clearing out their space. I was highly impressed with the speed and efficiency displayed by exhibitors vacating their spaces. I was even more impressed with the sense of community spirit and cooperation within Studio North, as exhibitors choreographed their efforts to also help each other with lifting and wrapping and sharing tools etc. If the whole world worked this way, the whole world could work this way. Kevin and I were packed up and on the road less than 2 hours after the show closed, and that was no mean feat considering that we had to dismantle and move some very heavy cabinetry from the show floor to the loading dock and into a mini-van. All in all the response to Kevin's display was phenomenal, and we'll see in the coming weeks what develops in the way of leads. In the meantime it's back into the shop tomorrow. There's custom furniture to be made.